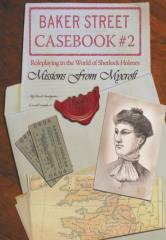 Missions from Mycroft is the second collection of cases for the Baker Street roleplaying game. Work for Mycroft Holmes on missions of international importance! Sherlock’s older, smarter brother needs your help. Casebook #2 features 8 new adventures of the utmost importance. The investigators have their work cut out for them! Can they solve these mysteries? Can they save the Queen? Let’s find out!